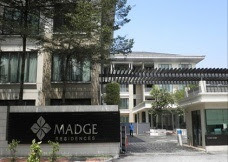 Madge Residences is a low density condominium located along Jalan Madge in Ampang Hilir, Kuala Lumpur. Madge Residences consists of only 21 condominium units in three blocks of 4.5 storey with built-up area of 6,550 sq.ft. each. Built-up Area : 6,550 sq.ft.